This critically acclaimed look at American war propaganda exhumes five decades of remarkable archival footage to show how presidents from both parties have relied on fear-driven political spin and craven media complicity to sell a succession of wars to the American people. The result is an invaluable introduction to how propaganda, public relations, and perception management function in democratic societies. Essential viewing for courses in media studies, political science, journalism, and U.S. history. Narrated by Sean Pean, and based on the bestselling book by renowned media analyst Norman Solomon. Norman Solomon is the author of several books and of a weekly nationally syndicated column on media and politics, "Media Beat". Solomon is the founder and executive director of the Institute for Public Accuracy, a national consortium of policy researchers and analysts. Solomon has appeared as a guest on many media outlets including the PBS NewsHour With Jim Lehrer, CNN, MSNBC, Fox News Channel, C-SPAN, public radio's Marketplace, and NPR's All Things Considered, Morning Edition and Talk of the Nation. "One of the clearest and most effective films on the Iraq War to date." "A superb visual form of investigative journalism. It chillingly exposes government officials who have used deception to send our young men and women into the hell of war, and who have condemned innocent families in the Middle East to death. But more, it investigates journalism itself, documenting the collusion of the national media with the warmakers, and thus alerting us to the betrayal of democracy." "Sobering and more than a little scary..."
"Packed with archival footage and newsclips... skilfully edited." "Compelling... A keen analysis of how war has been made easy by well-oiled propaganda techniques." "A powerful construction of information and complicated questioning that is critical to understanding the current Iraq conflict and previous combat situations." "...Goes further than most recent documentaries on the current Iraq war by not merely looking at Bush Administration mismanagement or avarice, but also examining propaganda that the U.S. military and government repeatedly use." "One of the top documentaries of 2007." "... Demonstrates that democracy, which depends on an informed public, has been ill served." "This DVD inches us ever closer to the harrowing truth about 9.11 and the invasion of Afghanistan and Iraq." "The documentary is fascinating on its own, or as a companion piece to media critic Norman Solomon's 2005 book of the same name. Regardless of one's political stance, War Made Easy is highly recommended viewing..."
"A cinematic essay, a simple and pointed piece with a compelling argument..."
"Compelling... a bucket of ice water to the face in an attempt to wake up an unsuspecting public." "This DVD may well re-write history." "... A tightly constructed and absorbing survey." 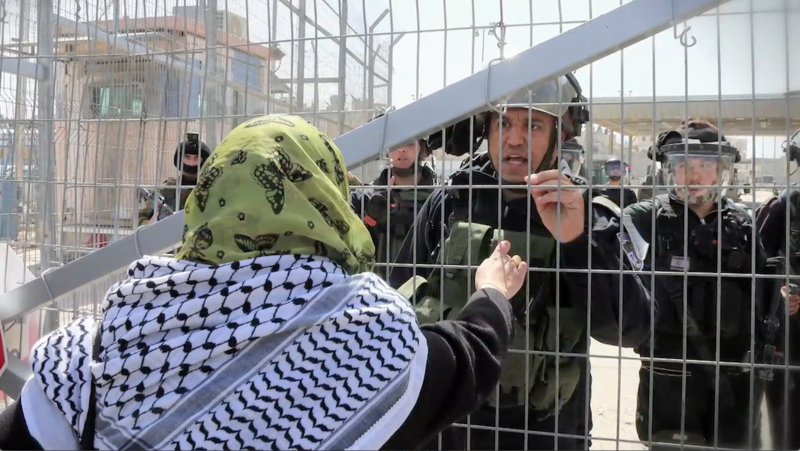 "This documentary is a powerful work. It raises important questions, reveals a pattern of official distortion, the abuse of presidential authority and the complicity of the news media in allowing it to happen. It should be eye-opening for students. It would be useful in an investigative reporting class to watch and learn and for those teaching mass media research to provide lively source material for further examination, particularly in agenda setting and framing research. The archival film footage is a historian's dream to follow the patterns of military propaganda for the past fifty years." "... It's a good time to be watching a film like this and ask ourselves what we should be asking our leaders and whom we should believe." 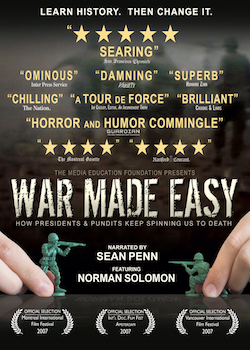 "War Made Easy is an excellent, but boldly partisan work. The evidence is compelling and well researched. This film is recommended to anyone wishing to examine the relationship between media and politics, or the American media culture in general."